We are a small cattery situated in Gällö in the middle of Sweden. The name "SillyZone´s" came out of playing with the name of our first cats "Sillen" and "Ozone" The meaning of it was funny and, just as we are, a little bit silly! and also members in Skogkattslingan. 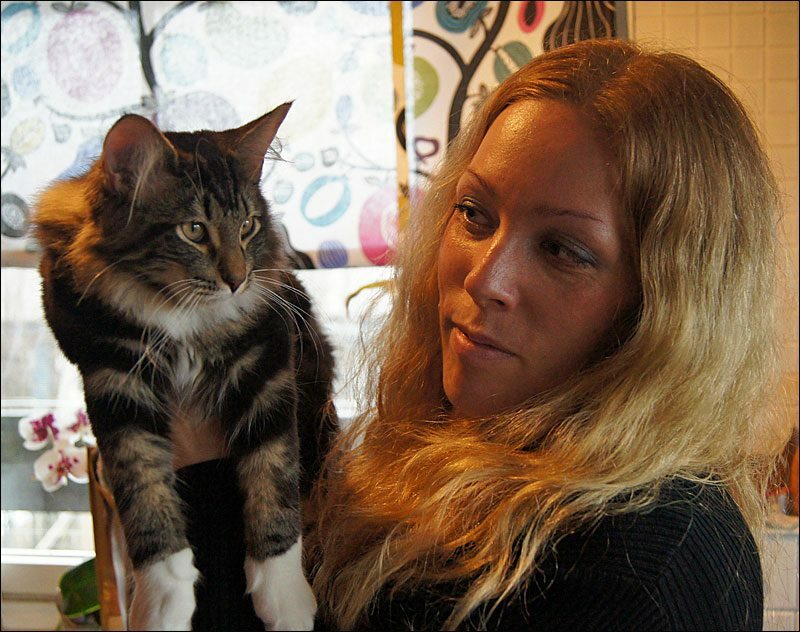 We are a small cattery with two Norwegian forestcat breeding females and one stud . We participate in breeding programs against GSD IV and HCM. GSD IV is a genetic disorder in the metabolic system that results in death for the kitten/cat and HCM is a hereditary heart disease. This you can find more information about in Skogkattslingan. All our cats live with us in our house and they also have a catrun where they love to play and lie in the sun. All our kittens are well socialized and are allowed to move freely in our home. Our goal in our breeding is to maintain the most important features of the Norwegian forestcats... The body, the unique coat, characteristic head, profile, triangle, ears... There should never be any hesitation that it is a Norwegian forestcat that´s in front of you! Of course we set temper first and above all. Our goal is for the cats from our cattery to have both looks, temper and health. Interested in a lovely kitten from us? When you are interested in a kitten from us, first contact can be by e-mail, but later on we want to have a more personal contact with you in order to make sure that the kitten comes to the right home and for you to be well assured to get the kitten that is right for you. We always want to meet you in person before or when delivery of a kitten. We always make reservations to not sell the kitten if we have any doubts what so ever. but more often 13 or 14 weeks. ensures you to have a kitten that is well-functioning and secure. and is ensured for hidden faults in Agria for tree years. We like to have contact with those who buy a kitten from us and we appreciate that you send us pictures of the growing kitten! Of course you will always have lifelong support from us regarding your kitten. When kittens are sold abroad, you must pick up your kitten personally, or we deliver the kitten at the cost for travelling. No kitten is shipped without a carrier. The buyer is responsible to know the rules and regulations regarding pet import in their country. So... A lot of information at once! I hope you feel very welcome to contact me in any matter!